If you get a new computer that comes with Windows 10 preinstalled, you might want to downgrade it to Windows 7 or 8.1. Here’s what you need to know to do it. Microsoft hopes to have Windows 10 running on 1 billion systems within three years. An admirable goal, but one that does not take into account the requirements of the user. Windows 10 shares a lot in common with Windows 8.1; it is a smooth experience upgrading from that release. For Windows 7 users, the story might be a little different. Some older applications just work better with the older versions. If you purchase a new PC today, it likely will have Windows 10 preinstalled. Users still have an option, though, which is the ability to downgrade the installation to an older version of Windows, such as Windows 7 or even Windows 8.1. The copy of Windows 7 or Windows 8.1 you want to downgrade. If you don’t have a license, you will have to purchase a Windows 7 or Windows 8.1 license. If your system came preinstalled with Windows 10 Pro, you’d need to download or borrow a Windows 7 Professional or Windows 8.1 Pro disc. A product key from a computer that is running Windows 7 Professional or Windows 8.1 Pro. If you are exercising downgrade rights from Windows 10 Pro OEM, this key can be either a retail upgrade, full version, OEM preinstalled, or System Builder product key. Necessary hardware drivers for either Windows 7 or Windows 8.1. External hard disk to back up your Windows 10 installation. Have a copy of your Windows 10 Pro OEM product key available, just in case Microsoft support needs to verify it during activation. Here is how you can find it. Please note, this is for OEM preinstalled Windows 10 Pro licenses only. Press Windows key + X then click Command Prompt (Admin), at the command prompt, type the following command, then hit Enter on your keyboard. For computers upgraded to Windows 10 from Windows 8.1 or Windows 7, a limited option is available within 30 days to rollback to your previous version. If your upgrade to Windows 10 is more than a month old, then a manual downgrade will have to be done. If your computer came with recovery media, consult the documentation for instructions on how to reinstall Windows 7 or Windows 8 on your computer. If you recently purchased a new computer, preinstalled with Windows 10, only to find out it does not work with your hardware or software, or you just don’t like it, then you might want to consider returning the computer. The hassle associated with actually downgrading is not as convenient and smooth sailing as you might believe. Also, there remains a demand for systems with older versions of Windows, which is what you might prefer. Most OEM vendors such as Dell, HP, and Lenovo offer new model systems with a choice of Windows 7 or Windows 8.1. If your computer is still within its warranty period, then I suggest you take advantage of it and purchase an appropriate system preinstalled with Windows 7 or Windows 8.1. 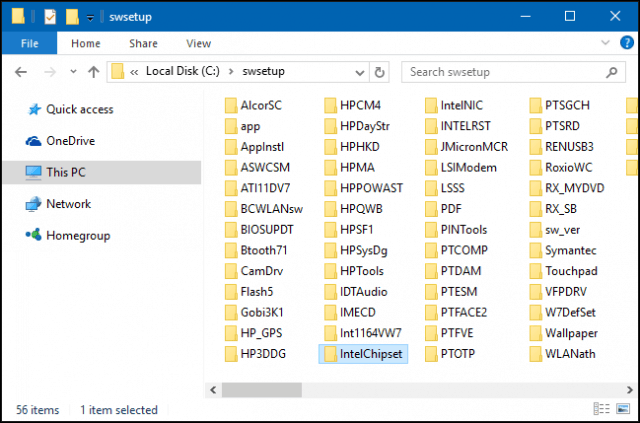 Microsoft made available, a list of vendors who are providing a selection of Windows 7/8.1 systems with support for Intel’s latest CPU architecture, Skylake. Microsoft recently announced plans to limit Windows 7 and Windows 8.1 support for future revisions of Skylake. This would make now an opportune time to upgrade to a new PC while they are available. Within a year’s time, Microsoft will only focus on supporting Windows 10 on future processor technology. Check if the manufacturer has native Windows 7 and Windows 8.1 hardware drivers available; depending on the model system, it is not a guarantee they do. You will need important drivers such as Chipset, Video, Network, Audio, and Storage to have a working system. A Windows 7 or Windows 8.1 license. If you don’t have a license for Windows 8.1 or Windows 7, you will need to purchase one. If your system came preinstalled with Windows 10 Pro, then you are automatically entitled to downgrade rights to Windows 8.1 Pro or Windows 7 Professional. 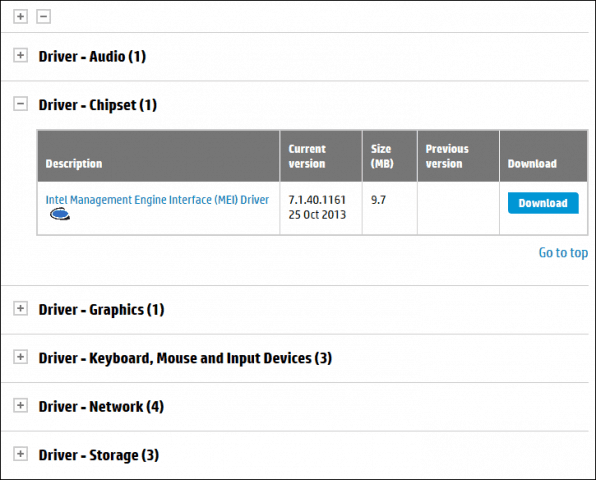 Go to the manufacturer’s website, and then look in the downloads and drivers section of the website. Enter the model number then click OK or Go. Once your drivers have been found, the website will usually have an option to filter the operating system. Click in the list box, select Windows 7 or Windows 8.1 depending on which version you decide to downgrade. Proceed to download all the critical drivers such as Chipset, Video, Network, Audio, and Storage. After downloading, save them to a thumb drive until you are ready to install them. You might not like Windows 10 today, or your trip back to Windows 7 might be temporary. In the future, if and when you decide to return to Windows 10, you can make it a convenient process for restoring a system image. This will, of course, be like performing a clean install, with minimal inconvenience. Check out our article for instructions on how to create a system image in Windows 10. You need to determine, the version and architecture of Windows 7 or 8.1, you will be installing. If your computer has more than 4 GB of RAM installed, use a 64-bit version. If your objective is compatibility with legacy hardware or software, then 32 bit will be your best choice, this will limit the amount of memory your system will be able to address. If you are exercising downgrade rights from Windows 10 Pro OEM, you can download a copy of Windows 7 or Windows 8.1 from the software recovery page. For Windows 7 media, you will need to have a valid product key. If you don’t, then the software recovery page will not work. Your next best option is to borrow a corresponding Windows 7 Professional disc from a trusted friend or family member. Installing Windows 7 or Windows 8.1 is a relatively easy process. Check out our articles for instructions on how to do so. The procedure involves performing a clean install. You can’t perform an in-place upgrade to an older version of Windows, from within Windows 10. Before starting the installation, you will need to disable Secure Boot and native EFI boot. This process is required if you are installing Windows 7. Also, disabling Secure Boot is necessary before enabling legacy boot. Secure Boot was first introduced as part of the Windows 8 wave of systems featuring a new security mechanism for protecting systems from malware. Disabling Secure Boot might vary across system brands and models; the process will require booting into the system’s firmware interface. Check out the following TechNet article for instructions on how to disable Secure Boot. After booting from your Windows 7 or Windows 8.1 install media. Click the option Custom (Advanced), then select each partition, then click delete until there is only a single, unallocated disk. Click New; this will create a system recovery partition. 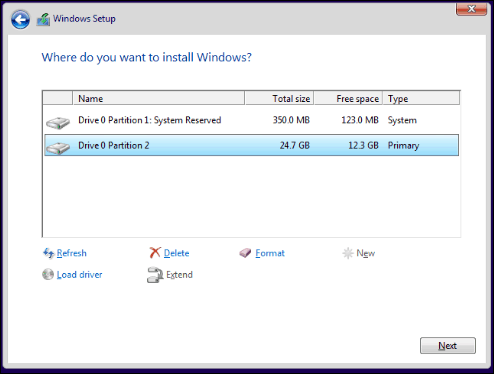 Choose the larger system partition then click Next to install your version of Windows. After installing Windows 7 or Windows 8.1, proceed to install the appropriate drivers you had downloaded in advance. Start off with the most critical which include; Chipset, Video, and Network. Your Windows 8.1 and Windows 7 installations will likely be out of date, so immediately check Windows Update for the latest updates then install them. Also, ensure your Antivirus utility is updated. Windows 8.1 includes a built-in Antivirus called Windows Defender. Windows 7 users can download Windows Defender or another free third-party Antivirus utility. Once you have Windows 7 or Windows 8.1 up and running, you will need to activate your license. Depending on the options chosen or available, this process should be smooth. If you had to purchase a retail or OEM system builder license, then standard Internet activation will be all you need to do. For systems utilizing downgrade rights through Windows 10 Pro, your options are tricky. According to Microsoft, you should contact the OEM about obtaining a license. These statements defeat the purpose of downgrade rights. The workaround in this situation is to use an existing Windows 7 or Windows 8.1 Product Key to initiate the activation. The tricky part of this is, it can be a product key that is already in use but corresponds with the edition. The burden is on you the user to find such a product key. Options include borrowing a Windows 7 Professional/Windows 8/8.1 Pro key from a trusted friend or family member. The intention is not to use the key to activate the license but to exercise downgrade rights itself. You can also use a product key from a computer preinstalled with an OEM Windows 7 Professional or Windows 8/8.1 Pro license. See instructions at the beginning of this article how to extract a Windows 8.1 Pro product key through the command line. Since you are now back on a qualifying version of Windows, you will get the notification to upgrade to Windows 10. Check out our articles here and here, for how you can disable the Get Windows 10 app from automatically upgrading your computer to Windows 10. When you do decide to upgrade to Windows 10 again in the future, you can choose the in-place upgrade route, or restore the system image you had created in advance. If you have accumulated data on the system, back that up first, then restore the system image. Phew, now that was a lot to articulate. Microsoft wants every PC to upgrade to Windows 10; the reality is that can only happen in a perfect world. We all have our various reasons why we still prefer Windows 7 or Windows 8.1; it is our right. Windows 10 is indeed the future, but I am sure many of us would prefer to embrace the future on our terms. I just installed windows 8.1 professional at my laptop, But not know how to activate using the activation key code. I have a HP Windows 10 machine. I have a install copy of window 7. When I try to install windows 7 I cannot get it to load the usb drivers so I cannot get my mouse and keyboard to function. But my windows 10 disk will. How do I over come this problem? make sure you have the keyboard and mouse plugged into the usb ports on the back, not the front ones with cables. make sure your not plugging them into usb3 ports either, as the drivers do need to load before it works. This is probably because you have Intel Skylake (6xxx series) processor in your HP. Windows 7 doesn’t support newer USB mode just after install and Skylake procesors doesn’t support older USB mode as far as I know. Also search Internet for how to install Win7 on Skylake processor. I am an NGO based in the US but all work is done in Tanzania, Africa. We bought 4 new dell computers with Windows 10 unknowingly. I was not apart of the procurement process. The computers are now here with me and we want to take them to windows 7. Windows 10 in our opinion is garbage. Microsoft needs to stop trying to be Apple and leave Apps alone. If we want apps we will go with Apple products. Back to my problem. I read that I should return these computers and get new ones with Windows 7 but that is not an option. Please send me directions on setting these up on Windows 7. Totally agree with you about try to be apple part!!! A lot of computer users are professional, those apps are good for Ipad or Iphone, but I do not want my computer acting as ipad or iphone. I already have a iphone in my pocket and I do not need another one on my desk. Hi, I have an pre installed os ( win 10 pro downgraded to win 7 ) .. when i got the item it was already downgraded to Win 7 .. Can i revert it back to Win 10 without any cost? how?? So I have windows 10 Pro which came with my laptop and I am planning on downgrading back to windows 7 if I do this will I be able to upgrade back to windows 10 in the future? Yes – Once running windows 10, you have that license for the life of the device. I’m considering buying a HP Envy 17t as it’s cyber monday today. Do you recommend downgrading to win7 or am I going to have driver issues and future problems with software? What is the chance that I could do it without problem? I’d rather keep my current computer than upgrade and have to use win10. This will make Windows 8.1 look like Windows 7 but work like windows 8. what is far far better tahn windows 10 or 7. The read Tweakhound 8.1 and you are set. Better if you make a partition of C: first. This is the only useful use of your preinstalled windows 10. This is the best alternative. Period. Windows 8 is NOT better than Windows 7 at all. In fact, nothing beats Win 7, not even 10 by a far stretch. Once Win 7 support is fully dead I am moving over to Linux. Microsoft has failed me – a MS developer since 1981. My Windows 10 will not allow legacy boot without the legacy rom so I get an error, ‘No drivers found foe CD/DVD Drive” and it won’t start Windows 7 without them. So no luck so far. have you tried going into the bios and enabling the legacy drives? that should get it to work. I’m having issues with the downgrade so I’m still working on it, but I have gotten the disk to start to boot. My only issue now is with the usb drives not working when I try to install. Please explain. I have Win 7 disk. My computer came with Win 10 installed. What is the best way to get Win 7 back? I have purchased a new lenovo laptop and it is pre installed win 10 home and now im willing to do my final year projects where win 10 dosent work and need only win 7 how can I make this .can i get win 7 and again after few years move on to the win 10. My situation is a bit similar. My laptop came with Windows 8.1, then I did the upgrade to 8.1 and then the free upgrade to Windows 10 then it automatically upgraded me to Win10.1(Anniv Edition) and I still have the product key for 8.0 on this latop.. NOW, I do not get an option to reinstall or reset my computer to to 8.0. but am I able to somehow do that? I would really like to go back to 8.0 since I can not go to 7.. Win10/10.1 is a flippin nightmare. How to downgrade windows 10 to windows 7 without previous version of OS..? Thank you! I personally try to steer away from products that are constantly forcing you to upgrade or update.. then when you reluctantly give in to it because you cant go any further if you do not SIGN IN to your outlook or hotmail account.. you dont get to your pc or the files. BOGUS. Its just another way to rob us from freedom of choice. if I wanted a computer to be specifically for one brand of email.. to have to sign in to all of my stuff only through that email… I’d have been another sheep herded by the massive destruction and lack of security knowledge.. do not like it at all. this is an email server… syncing everything you do all the time you’re logged in.. frickin ridiculous. Maybe I should finally move to apple and forget about this breach of trusts in advertising development and lack of choice in the matter. many times i dont want to be on the internet at all… and just work from my home network… and that is within the computer that automatically and demands you to sign in to windows through their email server. seems odd to me that this is so tough of an issue for the makers of microsoft.. or maybe theyve contracted their advertisers and they have to put bloatware and ads right inside the webpages 24/7. its ok. there’s no pop ups, but you just automatically allowed a number of companies your email information and ip address… what next? give me a break!! Hi. I am looking for a way to downgrade the below machine to Win 7 Pro 64 bit. Y8A65EA – HP ProBook 450 G4 – Intel Core i5-7200U, 4GB 2133MHz DDR4 1D, 500GB 7200rpm, 15.6″ HD SVA AG (1366×768), DVD+-RW, Numpad, FPR , Intel AC (2×2) +BT, Win 10 Pro 64, 1-1-0, SEA. thank you I will try this when my used windows 10 laptop arrives from ebay! Down to windows 7 pro, I hope! I own a Windows 10 pre-installed Dell Inspiron and recently downloaded a media tool from Microsoft to get windows 8.1, everything seemed to be going well but after I keyed in the product key it showed a “Something went wrong” error. Any suggestions on how to work my way around this!? I just had my PC “downgraded” from W10 to W7 principally because no driver was available for my Canon printer/scanner (with 2 new $30 tink cartridges in it) or my HP scanner and didn’t want to buy another just for that reason. I also did not like W10 throwing it’s selected news and other stuff in my face all the time. I don’t need a computer for that and don’t want it connected and spied on all the time. Do now I have learned that the processor is “unsupported hardware” for W7 and I will not only be deprived of some sort of “security updates” but have to put up with a big white window jumping at me all the time to remind me of that. Is it possible to “downgrade” to a W7 compatible processor without having to change the motherboard and, in the end, the whole PC ? My issue is frustrating. My friend has given me her Dell laptop. Pre loaded with windows 10 Home. But appears to have been originally a windows 7 setup. I would like to install win 8.1 pro. I have the 8.1 and 8.1 pro iso. I have 8.1 and 8.1 pro activation keys. I have tried to do usb installation. With windows 10 running as this was advised. It does not work. Because reasons?? Installation through boot up does not accept any of my product keys. all I get is the error msg, and it is immediate ” Unable to verify the product key. Check installation media” Is this an issue with dell or microsoft. And i have tried to get help from both sides..
Help from microsoft and its online assistants, sends me around in a circle which brings me back to the same issue. And Dell SA are completely useless. All I am hoping for is Windows 10 gone, and 8.1pro installed and working.